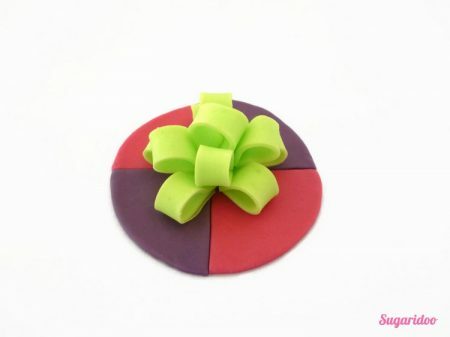 Roll out two different colors of fondant and cut a circle out of both. 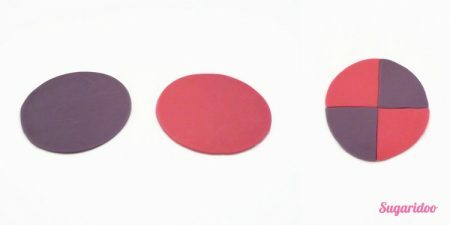 Cut these circles in quarters and combine the colors to two alternating circles. 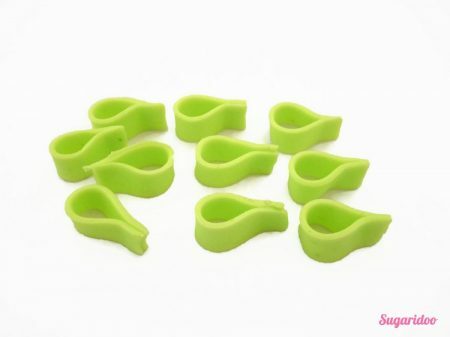 You can glue them together or just place them directly on your cupcakes. Now continue with you third color of fondant. Knead in a bit of tylose powder, this will let the bow harden faster. 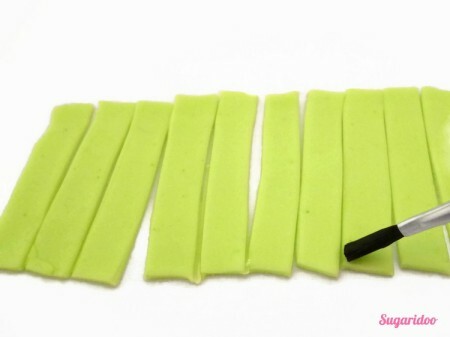 Roll out the fondant and cut strips of approximately 1 by 5 cm. 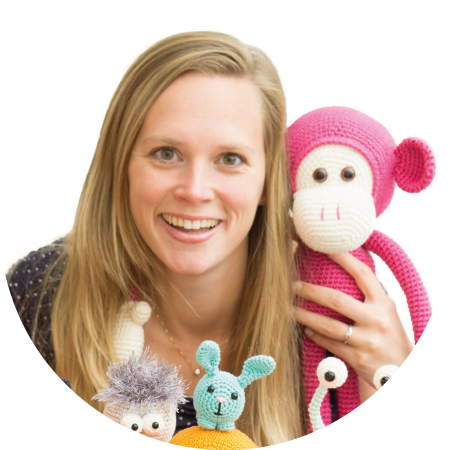 You can always shorten them later on, so it’s better to make them too long than too short. For each bow you’ll need 10 strips. Apply some glue to the ends of the strips and fold them together, keep the loop round. Let them dry on their sides so they will keep their shape. It can take a while before the will harden, you can make these loops a day in advance if you like. When they are ready, cut the end of the loops as was don in the picture below. Glue five of these on a cupcake. The second layer of loops will consist out of four loops. 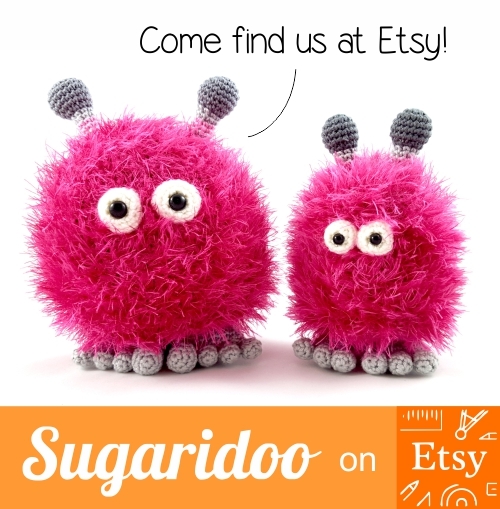 Place these on top of the first layer of loops with a little bit of glue. Then we’ll have one loop left. Cut of the end of this loop and place it in between the top layer of four loops. And there you have your bow! Now you know how it’s done, doesn’t that look lovely? 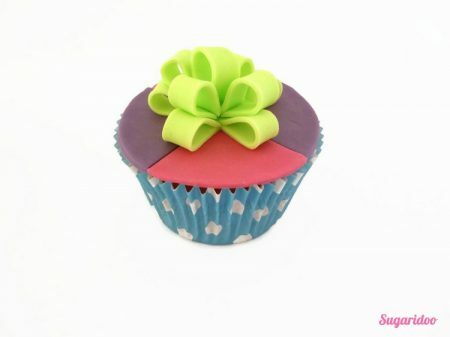 Have fun making tiny bows for cupcakes or small cakes!